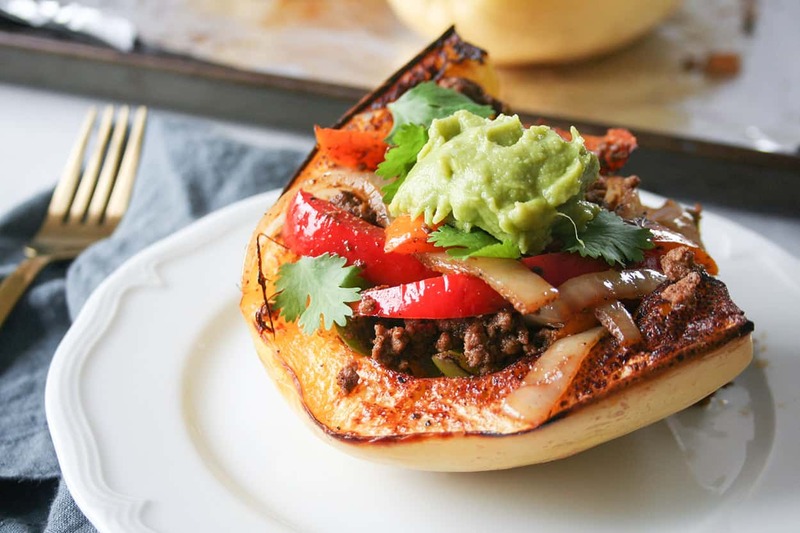 Simple and healthy fajita spaghetti squash boats stuffed with spiced ground beef, bell peppers, and onions – Whole30 compliant, paleo, dairy free, and naturally gluten free! Confession: I inhaled this fajita spaghetti squash boat in approximate 3.895678 minutes after I finished taking these photos. I made these on Saturday for lunch, started prepping them around 10:45… so of course, I thought I might be ready to eat them by the time I was all done. WRONG. I was famished. I was up early on Saturday morning, had a great lifting and cardio workout at the gym, and refueled with a big breakfast. So I was pretty confident it was going to be a nice slow day of recipe testing and shooting without feeling like ‘ohhhhhhh my gosh I need to finish these photos so I can eat!’. Somehow my stomach always has different plans. Spaghetti squash to me is pretty plain. Growing up my mom would roast it, add some butter, salt and pepper and serve it as a side. It was fine, but I really can’t eat it that way anymore. It just doesn’t do anything for me. But I love serving it as a a base for meatballs and pasta sauce; or in this case, stuffed with some bangin’ flavors and lots of veg. Just look at that – HUBBA. Spices. I’ve said it before and I will say it again – I love cumin. Gimme all the cumin, all the time. The spice mix listed in this recipe is my go-to taco/fajita seasoning mix and it has never steered me wrong. Toppings! I topped mine with guacamole and cilantro. But if you aren’t on a paleo diet or doing the Whole30, go crazy – I’d add black beans, cheddar cheese, and a dollop of Greek yogurt. The cooking method is also key. And the cooking method I swear by for almost everything, but especially meat, is my Lodge cast iron skillet. It is my most used kitchen item and it gets used every single day. But I love cooking meat in it because it heats evenly across the surface, sears meat to perfection, and each time you cook in it, the fat from your meat continues to season the skillet. 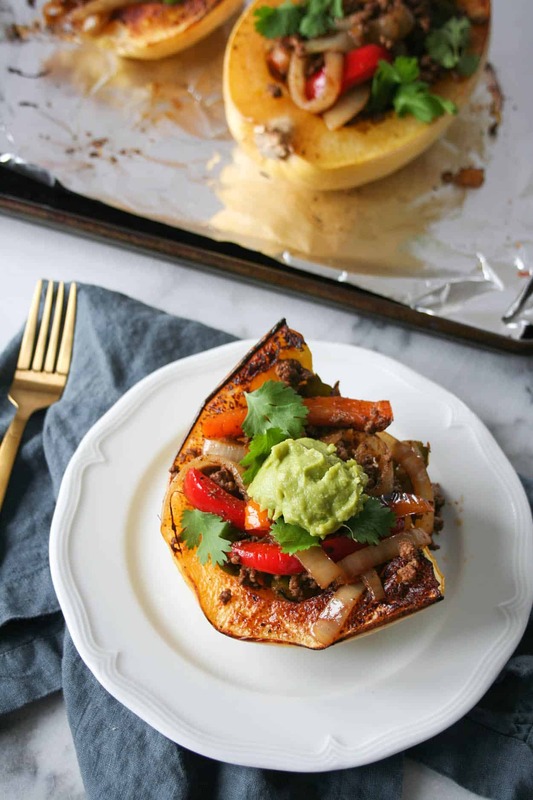 These beef fajita spaghetti squash boats are simple to make – as the squash is roasting, you saute your peppers and onions until soft and slightly charred. Then you brown the beef with all of your spices. Stuff, top, and eat! Tell me: What is your favorite way to stuff spaghetti squash? 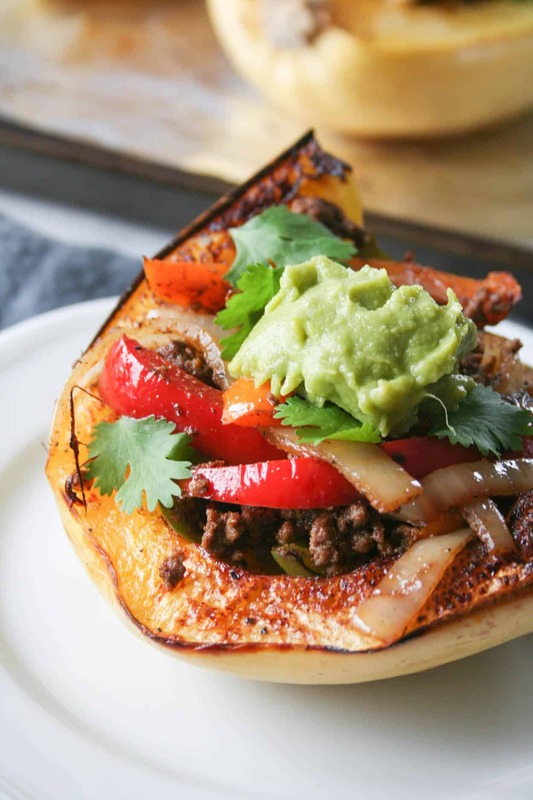 If you make this beef fajita spaghetti squash boats or any of my other recipes, post a picture on social media and use the hashtag #imhungrybynature for a chance to be featured! Line a baking sheet with aluminum foil. Spray with olive oil. 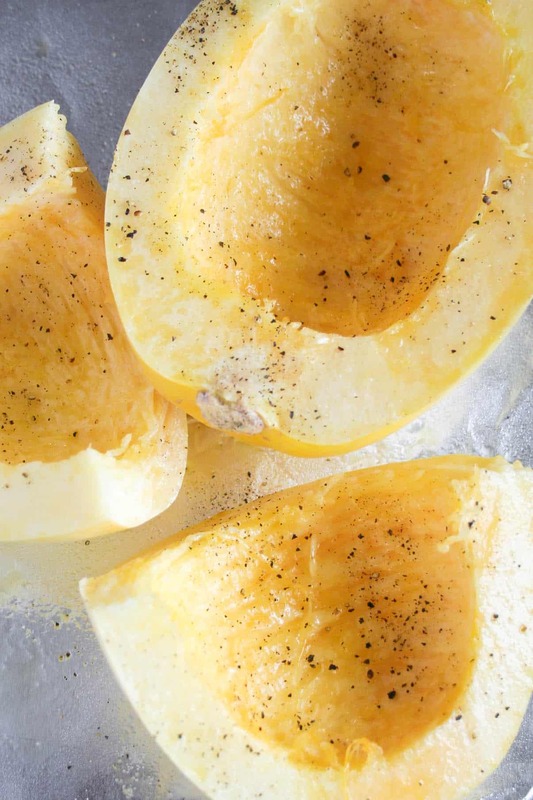 Cut spaghetti squash in half lengthwise and remove seeds. Spray with olive oil spray and sprinkle with salt and pepper. Place squash cut side down and roast for 45 minutes to one hour, depending on the size of your squash. Check for doneness starting at 45 minutes. While the squash roast, prepare your vegetables: seed and slice bell peppers and slice onions into large rounds and cut in half. Heat a large skillet (I use my 12 inch Lodge cast iron) over medium high heat until almost smoking. Drizzle 1 Tablespoon olive oil in pan. Add peppers in a single layer and do not touch. You want the peppers to get a nice char. This will take a few minutes. After the char begins to form, add the onions and sprinkle with a little salt. Mix the onions and the pepper; continue to saute the vegetables, stirring every few minutes, until soft. Remove peppers and onions and bring skillet back up to almost smoking. Add another drizzle of olive oil and ground beef. While the beef is cooking, add all of the spices and cook until no longer pink. Add the pepper mixture back in to the skillet, stirring to combine. Keep mixture warm until squash is done. When the squash is done roasting (you should be able to push the skin with your finger and it will be soft), cut each half in half and stuff with the fajita mixture. Add your toppings of choice and dig in! I’d like to sail away on that! 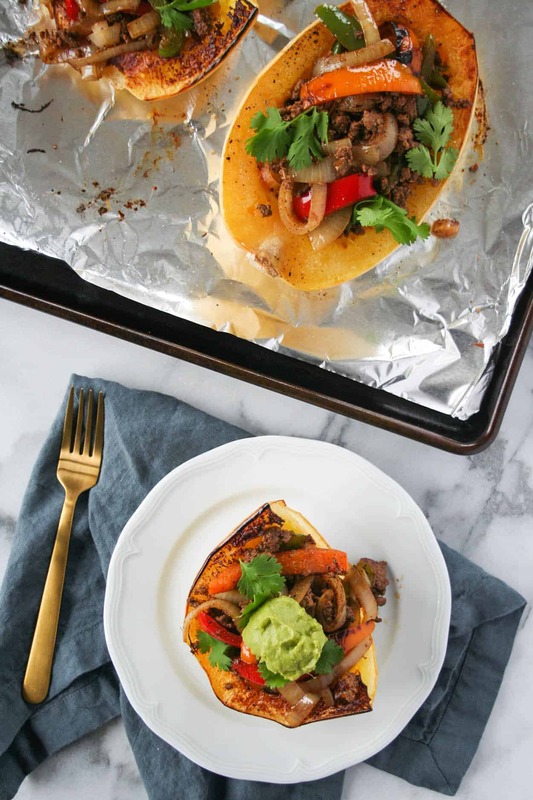 spaghetti squash on its own is good, but with fajita flavors, it is great! This looks amazing! This is my kinda meal – looks fabulous! Beautiful picture too! Thank you so much Debra – you will LOVE this! These look delish!! 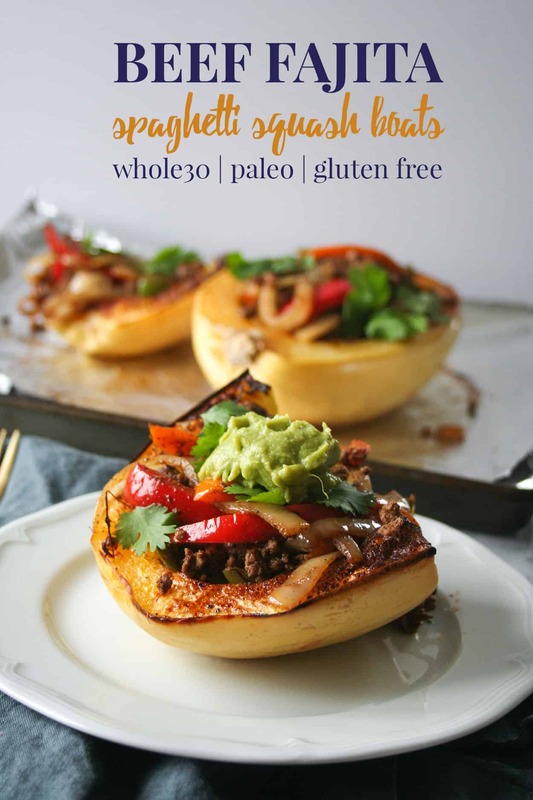 Spaghetti Squash taco boats are the bomb!! I love cumin too, so flavourful. Thanks Myra! And cumin – oh it is my ultimate fave!! 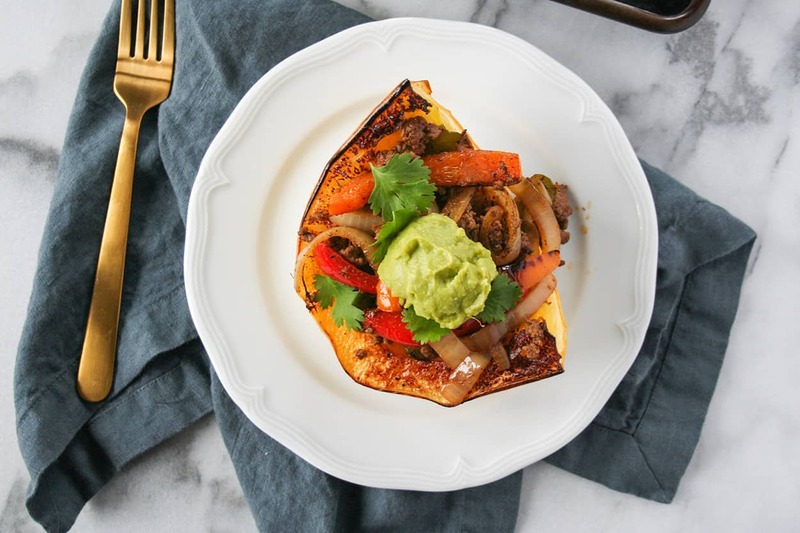 I used to devour spaghetti squash EVERY SINGLE DAY – no joke, like 2 squashes a day too… But then. Then I went cold turkey. It’s time to re-introduce this bad boy back in my life, because really, he is just such a GOOD boy! That is a TON of squash! I think I would get sick of it if I ate that much… but you should definitely reintroduce it with this recipe! Please come cook for me! PS love your fork! This looks delish! I am always trying to figure out a new way to eat spaghetti squash (I usually just make a spaghetti meat sauce to go with it… boring haha) Also, I love cumin too! I put it on everything. Saving this! That’s my usual go-to as well! But you will LOVE this. Mmmm you know I love me a good paleo/whole30 meal!!! I HAVE to add this to my menu next week! This is such a good idea!!! Strangely enough, I’ve never made spaghetti squash. This looks like a must try for me! I cannot believe you’ve never made it! I love spaghetti squash because it is so mild and really takes on whatever flavors you add to it. I hope you love these! Oh wow, now that is my kind of recipe! Easy, spicy and full of flavorful healthy goodness. A guaranteed crowd pleaser! Love it. Thanks Gabriel – I hope you love it! !